When Esther Beauchamp agrees to drive a snowmobile during the Santa Snow Challenge, she expects a problem-free weekend of transporting snowboarders. What she gets is the task of transporting a single snowboarder and babysitting his service dog while he’s on the slope. Robbie Kendrick is instantly attracted to the pretty staffer who volunteered to help him during the competition. 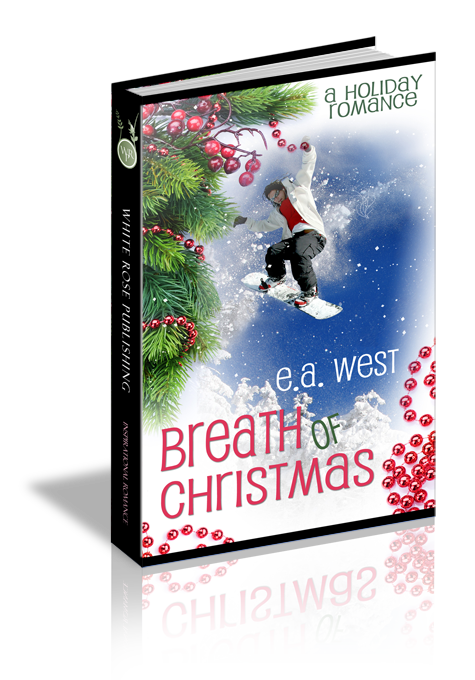 While she’s clueless about asthma, he appreciates her efforts to understand how it affects him and his snowboarding. Best of all, she treats him like a man who isn’t disabled and gets along great with his medical alert dog. But when Robbie’s ability to compete is called into question, is it in God’s plan for him to give up the career he loves, or will his competitive spirit cause him to lose his chance at a future with Esther? Early morning sunlight sparkled off the fresh snow making Esther Beauchamp thankful she’d remembered her sunglasses. The brisk air invigorated her as she watched the crowd arriving at Cedar Valley Resort for the Santa Snow Challenge and added to the festive atmosphere created by Christmas decorations on every building, a few trees, and the resort’s lone ski lift. Esther’s heart thumped with anticipation. This was her first big event since moving to the small Colorado resort town. Never mind the fact that she’d never skied a day in her life; she knew how to drive a snowmobile, which was enough to qualify her for the position of competitor transportation at the slopestyle course. She adjusted the safety orange jacket she’d been given and wondered how many people it would blind when the sun hit her. Black letters on the left front labeled her as “Staff,” as did the large black letters across the back. So far, she’d only been asked for directions by a few parents herding exuberant preteens, but she should soon meet the competitors. Her boss and neighbor, Leonard Morris, approached from the left. The clipboard in his hand had seen better days, and it looked as if he’d tried to cram every paper from his overcrowded desk onto the thing. However, his cheerful personality more than made up for his lack of organizational skills. “So, what happens if he doesn’t make it through to the finals Sunday? Does that mean I’m out of a job?” Although this gig was for one weekend only, the extra cash would help pay off the student loans that lingered from earning her computer science degree. Suddenly, she wished she knew more about winter sports. Ever since she moved to Cedar Valley a month ago, she’d been listening to people talk about the Santa Snow Challenge and the competitors they expected to see. Esther had never heard of any of them, but it quickly became clear she was a minority in this small ski resort town. Leonard wandered off, speaking in to his radio as he walked, and Esther turned towards the huge lodge constructed of logs. The rustic building nestled in the valley between mountains welcomed visitors and offered the promise of a warm fire and comfortable chairs after a long day on the slopes. The other resort buildings had the same rustic, log-cabin look, and the design elements had bled over into the rest of the small mountain town. The job offer by a small software company in downtown Cedar Valley had originally brought her here, but the laid-back atmosphere of the area had convinced her to take the job. She sidestepped a couple of kids chasing each other, her thoughts going to her charge for the weekend. Why would a snowboarder need a medical alert dog?